This director of business development is on a Facebook cleanse while she tries to avoid celebrity diet tips. The Recommendation Engine is Campaign US' weekly feature in which we learn about the media young people in the ad industry are currently consuming. This week, we get to know Stephanie Wiseman, a director of business development at Oakland-based digital marketing agency Fluid. I just finished a binge of "Friends from College" on Netflix, but I typically watch TV on Sling while traveling or multi-tasking. I flip back and forth between MSNBC's "Morning Joe" and "Real Housewives of Orange County" and "New York." If someone wants to psychoanalyze that for me, I would greatly appreciate it. I'm just getting into the cool kids club with podcasts ("The Daily," "Pod Save America," "Science Vs."). Now that Spotify has analyzed every data point in my life, my go-to is its "Discovery Weekly" playlist, which is scary accurate and why robots will take over the world one day. I bought a book that I read at the dog park and while traveling—total #tbt move. 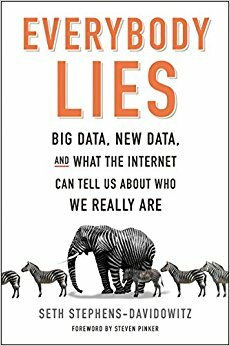 It is called "Everybody Lies" and is about how Big Data from sources like Google challenge conventional wisdom and create predictive models. I am on a Facebook cleanse—sorry Zuck—and Instagram is really my only social network. I follow every cheesy meme account and LiketoKnowIt, which is (in my not so professional opinion) the best invention ever. Also, if you're not following Bros Being Basic, you're missing out on why the internet was invented. Quickie diet/beauty recommendations from celebrities. When will I ever learn?